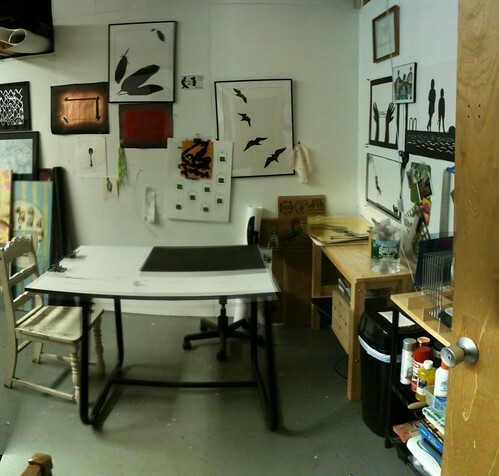 Check out this weirdly cool mis-aligned panoramic-ish photo of my studio. I cleaned the hell out of it a couple weeks ago. it is now a total mess, because I have been working in it! time to clean it again, and re-arrange my art on the walls for SOS 2012. 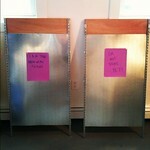 Here is my SOS profile, and here are all my fellow Washington Street artists. First up! 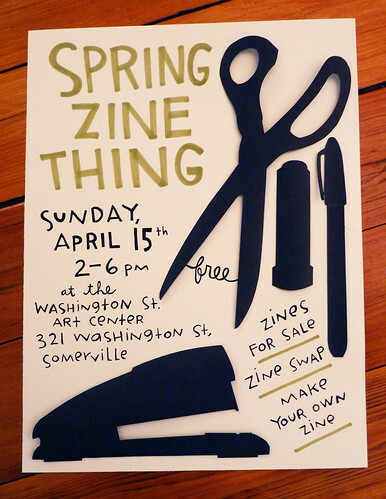 Spring Zine Thing is full up with awesome zine people ready to come sell, swap and talk zines all afternoon at WSAC on April 15th from 2-6PM. That link up there goes to our facebook event where you can see the list of zines and zine makers and libraries coming to hang out, and click their links to take a look at what they make. 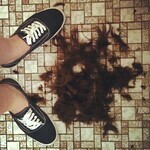 Super exciting! The event is free and open to the public, and you can get directions and more info about the WSAC here. And other than that, I have been working in the studio for myself, for friends, for family. Other than being dead tired from seeing 3 shows last week (white pages! balaclavas! wild flag! hunx and his punx! heavy cream! radio control! ), things are great! Here is my life of the past few weeks in a series of instagram photos. papercutting is still my true love, shaved my head into a chelsea (lolz), new crappy flats, eyeball manicures, propagating plants, too much drawsomething, being a good cookie with friends, new WSAC sign, silkscreening with Eddy P for La Parca. 1) I got a grant to do art! I mean, I still had to go to work the next day, but still! 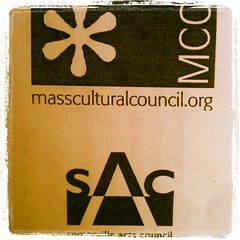 Huge thanks to the Mass Cultural Council, and the Somerville Arts Council. I applied along with several friends back in October, thinking why the heck not. It was a great experience to make myself catalog all my recent work, and write up a full CV and artist’s statement. Then to top it all off, I got a notification mid-January that I actually received a grant. My first ever! So so so so excited. As part of the grant, you get to put on an event to show what you have done, which leads me to my next point. I love art and Somerville and Massachusetts! 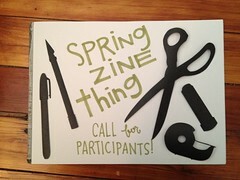 2) Marissa and I are putting on a zine event, called the Spring Zine Thing for April 15th. Check out that facebook event link and reserve a spot to sell or trade your zines! Spread the word, this will be a really fun afternoon of hanging out with cool zine people. We are putting this on as a Small Craft Advisory event, and SCA is also working on the Union Made summer fair as well as starting to work out the details for the Bazaar Bizarre of December 2012. Plus anything else fun we can think of before then. I’m going to make a zine with Marissa for this about getting inspired about art and stuff. 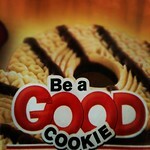 You should make one too! 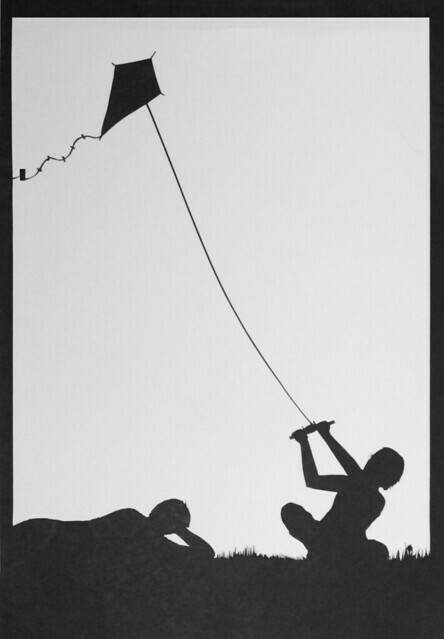 4) Signed up to take a paper cutting workshop with Béatrice Coron at Mass Art in March. HOLY CRAP IM SO EXCITED SHE IS AN AMAZING ARTIST. 5) I have done a bunch of stuff with art and friends in general this winter. I had the pleasure of hanging out with the Lady Fest Boston people for their January events at WSAC, and donated 2 pieces of art to their benefit auction. I had a piece up at 13Forest in Arlington for their show Plenty. 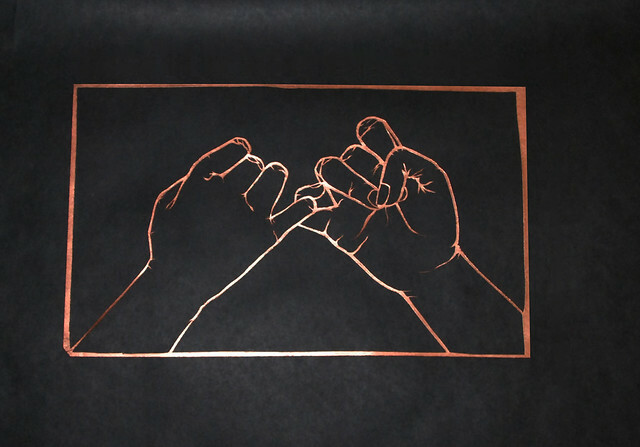 I have silkscreened some collaborative projects with friends for Gather Here. 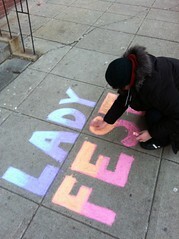 Just so I have another picture to break up all this text, here are some photos Jen took of me making a quick sidewalk sign for Lady Fest in Central Square. Try not to think about me touching the sidewalk in Central too much. I am not easily grossed out, but this was pretty gross and I washed my hands 5 times in a row afterwards. I will make a post with some actual art I made soon! I guess all of the above shows how busy I have been. You can also read some miscellaneous posts I have made over at the WSAC blog or the BBB blog in the meantime if ya innerested. 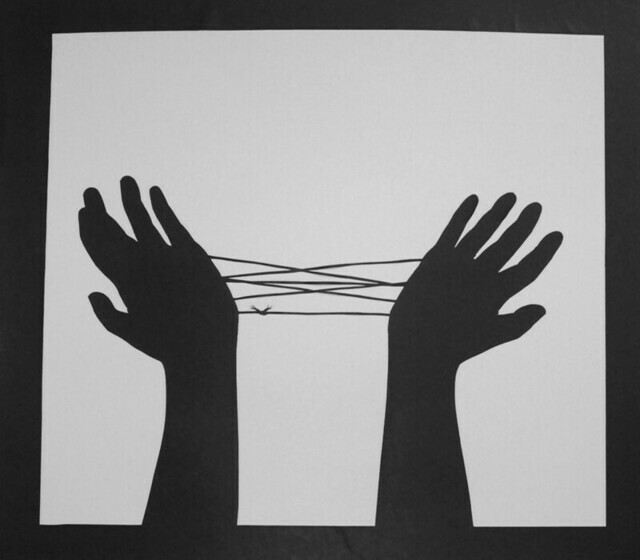 I really love drawing and paper cutting hands. All the little precise creases and joints are so satisfying to measure out and get correct. Here is an in-progress piece that I started last week, and got about 2/3 of the way finished. Nine hands in total! You can see that I drew a grid to help me space things out. Just like with hand lettering, I like to have a grid down to make sure I can do repeat shapes and images evenly so they look like they are on the same plane or in the same perspective. 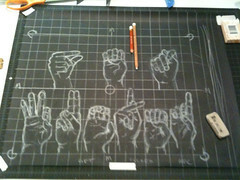 I measured the finished size of the paper, which I think was 12″x16″, and measured out the halfway point on each size. From there I just drew the rest of the grid using the width of my ruler, which is about an inch. Not a perfect grid, but enough to go on. And here is a completely finished piece, just 2 hands, titled ‘Swearing is Still Fun’. I did this really quickly at the beginning of last week. 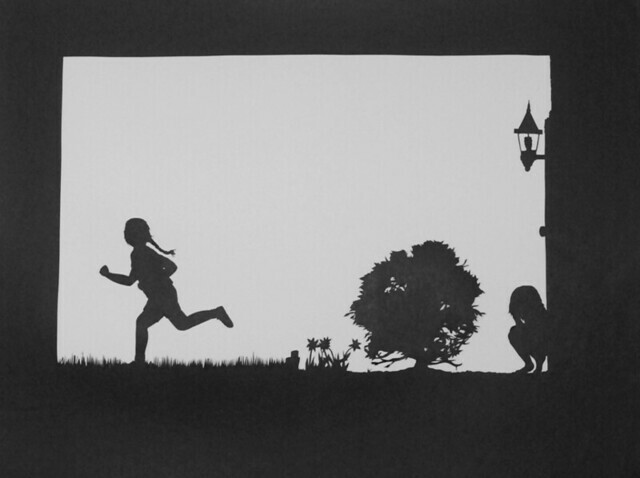 It was started from a sketch, and made into a finished drawing, completely cut out and spray painted in 1 hour. In the end, the border will be underneath the mat, but for positioning the papercut with either spray adhesive or studiotak on the back, the square frame really helps with laying the final piece flat when there are so many thin lines. 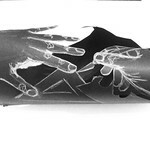 This week I hope to finish the hands piece, as well as get a few other pieces matted and framed. I am also putting together a benefit art auction called Something Sweet which I will post about more tomorrow on the BazBiz blog to get the word out. It is a group effort of artists at the Washington Street Art Center to benefit the Somerville Homeless Coalition. I luckily got the task of finding artists to participate! So far we have received almost all of the pieces for the auction, and it was really awesome to go through all my favorite current local artists and ask if they would want to participate. So much great work, the show is going to look amazing. There is a bit about the show up on the WSAC website, as well as tons of links, images, and info up at the Something Sweet facebook event. Come by Friday November 4th from 6-9 for music, food, and silent auction for some totally amazing art! Some of these have been up on here before in various stages of work in progress, but they are all done and mounted! I still have a few more in this series to work on, and a couple more I would like to draw out and start. For this next series I have quotes and text I want to use, mostly about art itself. I got the technique of spray painting the paper cuts down with this piece, and am really happy with the metallic silver. I think the next one will be metallic copper. 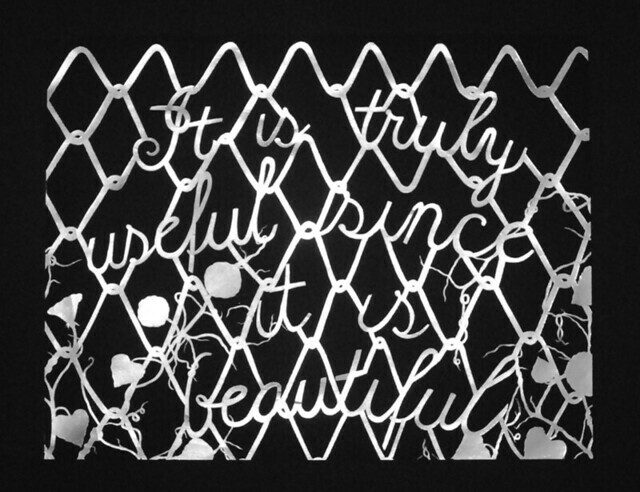 Currently this piece is up at the Tangled exhibit at the WSAC until next Saturday, October 29th. Stop by for gallery hours on Saturday and see a ton of great work! Top row: white Magic-Rub rubber eraser, metal (cork backed) ruler with english and metric, rainbow pack of Staedtlar marker pens in the stand-up case. 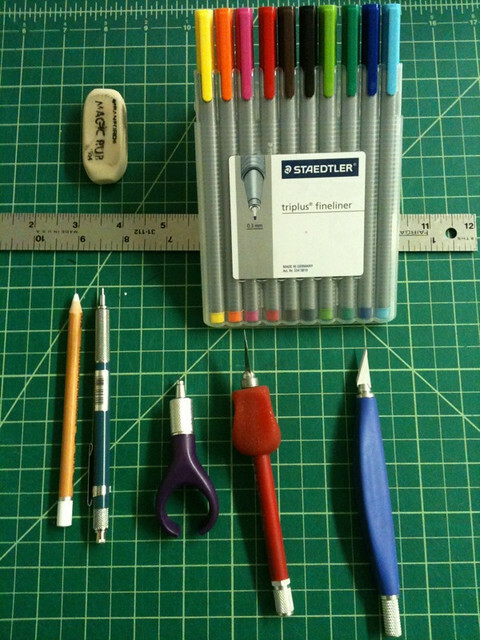 Bottom row: chalky white soft pencil, medium-hard .3mm Alvin mechanical pencil, purple Fiskars swivel tip blade, Blick standard red blade handle with a soft rubbery gel grip on it, and a blue Fiskars triangle shaped blade handle. On: 24″x36″ Alvin gridded rubber mat with various angles outlined. My marker and pen selection is 100% related to the papers I like to use. 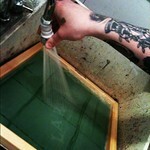 I like very smooth papers, like vellum and tracing paper. Anything with texture or tooth is not really my thing, and I also really like cutting black or deeply pigmented dark paper. The white pencil is perfect for sketching and laying out on dark papers, and the magic rub fixes all my mistakes. I use the fine line markers when trace paper sketching, to play with different ideas and overlaying elements. I use different colors on each layer of trace to play with ideas. If I have opaque, or lighter-colored paper, like in my sketchbooks, my design background has made me super in love with mechanical pencils. For the same design reasons, I always have to have a good ruler handy. The metal ruler is perfect because it is nice and heavy, the cork has good grip on the back, and I can also use it to make smooth, long, straight cuts with my knives. I probably have 7 different rulers, all for different uses! My knife collection is pretty extensive, and this is only about 1/2 of it. 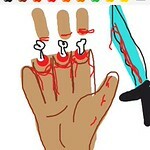 When you cut a lot, you need to give your hand a lot of changing grips just to keep your fingers flexible and not cramped up. The different types of blades that can fit in each knife also are good for different types of cuts. Some knives feel better for straight, long, even cuts, while other are far better for curves and small details. If you have a generic x-acto knife, I cannot recommend putting a 99 cent gel grip on it to save your hand and wrist. Not pictured are my giant boxes of fresh blades, of course. Switching up the blade often keeps things smooth with minimal snags. With fresh blades you also don’t have to apply as much pressure so your cuts can be more free, and more delicate. Somerville Open Studios was pretty fun! It was a really nice weekend, so it was a little hard to sit in my studio all day, but I had enough visitors to keep it interesting. Everyone at the WSAC brought in snacks and drinks, and we all milled around and played music all day. I was able to sit at my desk and get a bunch of work done too. 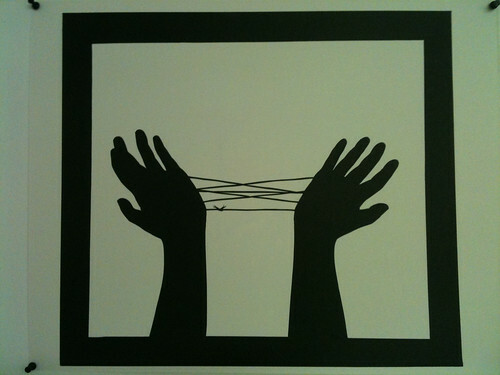 I made all of my studio visitors play Cat’s Cradle with me all day (also known as Hexenspiel in German!). 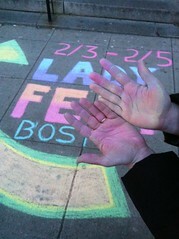 It was fun to remind people of it, and then have a reason to stare at and draw their hands. This piece is pretty big, about 24 x 36 inches. I have been working pretty large lately, which is good for getting a lot of negative space, and a ton of detail into small areas. There is another piece that I started on the last day of S.O.S. and finished slowly over the past few weeks. It is about the same size as the one above, and here is just a detail of one corner. The bush there is about 3 inches tall, the crouched figure is maybe 2 inches tall. I love doing tiny little details so much. 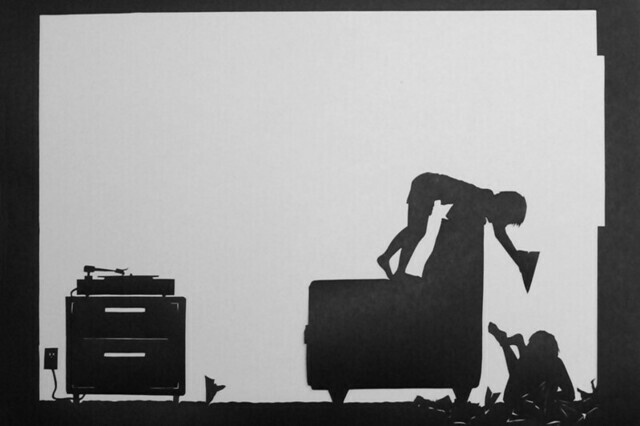 Last week I set everything up and spray mounted these paper cuts to white bristol. Spraying them and getting them to lay smooth and flat nearly killed me. 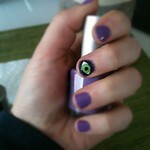 I could have ruined all of them, but managed to get them all done, with only 1 really annoying wrinkle. I think most people would barely notice the wrinkle but it bothers me. Luckily once I get these framed and matted, the wrinkle will be 90% covered up! I left some of the wires/string details bowing out from the paper ever so slightly as well. 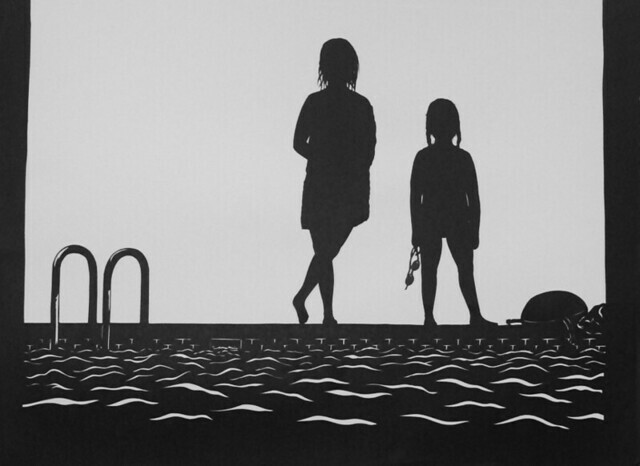 It makes an effect that I really like, because it calls to attention that these are cut paper, not drawings or silkscreens or some photo process. I think my next post will be a tools post, which I am pretty excited about. I love new tools and talking about tools and supplies! 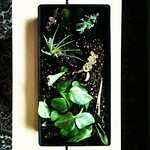 Somerville Open Studios is Saturday April 30th and Sunday May 1 this year. I will be at the Washington Street Art Center with my studio-mates, and you can check us all out on the S.O.S site here. 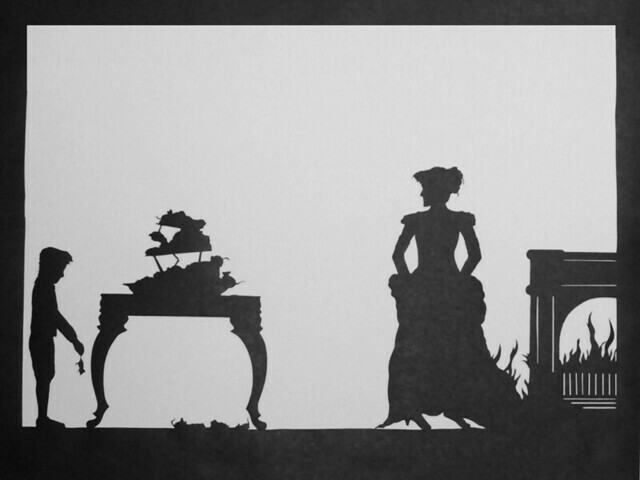 I have been working on 2 sets of themes for papercutting, one of which is a series of flowers. 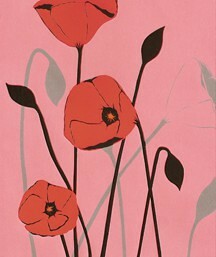 These poppies are finished, and this is a teeny resolution of a proper scan of the finished piece. I used Canson paper, in 8.5 x 11. The Canson is pretty thick, so it was hard to get fine lines, but the sturdiness helped with preventing wrinkles. Using vellum is also new for me. While I love looking at pretty things, I don’t usually make things that are pretty for the sake of being pretty. These poppies are the first in a series of trying to get over that. I love art nouveau, especially the flourishy floral stuff, and I was thinking about all the beautiful stained glass at the Smith Museum in the Chicago Navy Pier. It is spring here and flowers are starting to go nuts, so while I was drawing the other week I decided to work on some pretty things related to that. 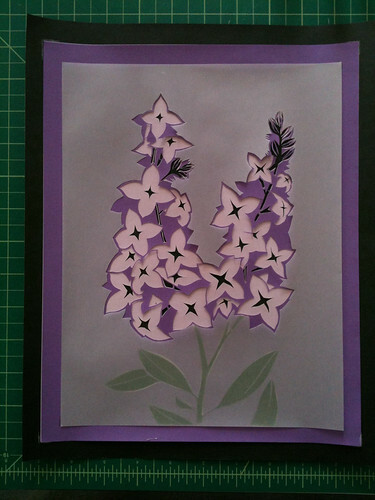 These lilacs aren’t quite finished yet, maybe about 90% done, and so far I like the layered effect with the vellum. I bought a new brand of thin art/craft paper that is really nice to cut, and comes in a package of nice bright colors. It is 11×17, so quite a bit bigger than the paper I had been using. I am getting used to this paper and think I will continue to use it, since I like the smooth flat color, as opposed to the more textured Canson paper. I also really like that this craft paper is white on the backing side, even though at first I thought it would be a problem. Using the vellum is nice because you can mute and mask the colors and cuts underneath to focus on one area. It is super hard to cut though. The vellum snaps when you slice it, and if you dig or wrinkle the paper, it ends up with these sort of milky scars. So you have to be really really careful, especially with curved edges. The ranunculae are less finished, and I am not as sold on the way they are coming out. The backing green for the leaves will probably be switched out for black, and I will likely add some other flowers so you can see the dark fuschia second color under the pink more. 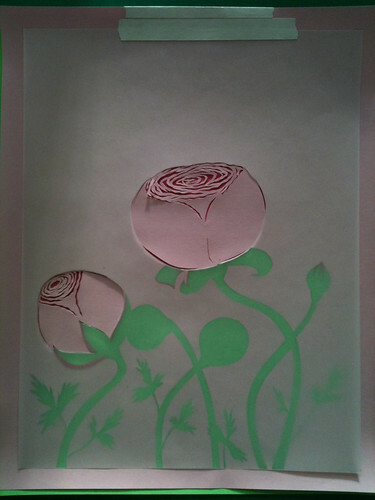 I do like how the details of the bunched up petals came out, so I am going to keep working on it to try to salvage it. 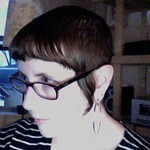 Right now I think it looks a little half-assed. 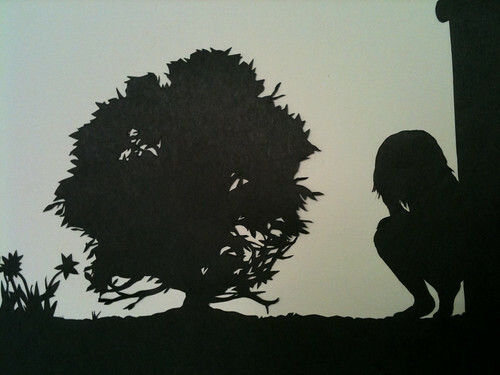 When they are pressed flat, and in nicer light, both papercuts look less messy. I like to take crappy quick cell phone pictures of in progress work! When making 2D art, I usually have some sort of narrative, or at least scene set up, and almost always include human or animal figures as the focus. It is sort of nice to just focus on color, form and composition without thinking about a narrative, but I end up feeling less psyched about the finished product. 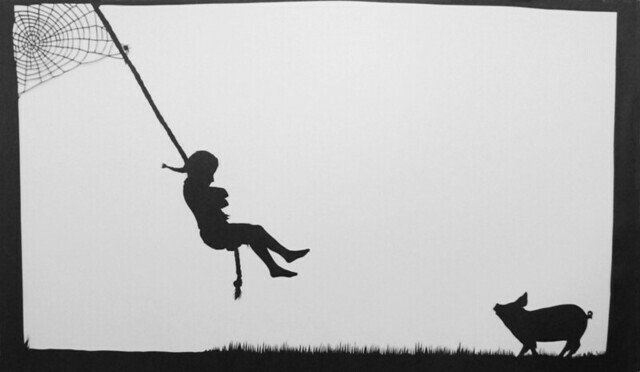 The other series I am working on are all images of children, mostly girls playing outside. For these I have been using the flat black paper I used for the Feathers & Scales pieces. I feel a lot more invested in the 2 finished scenes I have for these. When I was making them I was working out more ideas in my head, where as with the flowers I was just thinking about…flowers. I am going to show them all for a critique at the WSAC on Thursday, so it will be interesting to see what other people think of these 2 series, and if my mental investment in one series more than the other comes through.